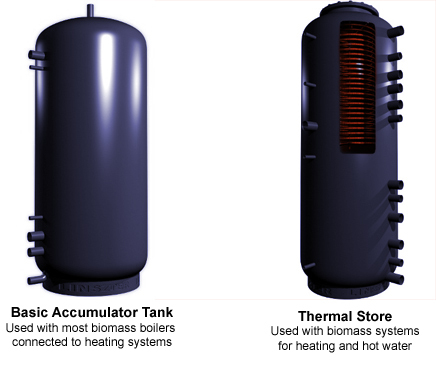 All biomass systems usually require the addition of an accumulator tank, which acts as an in-line heat storage battery. They range in size and shape greatly, typically from 200 litres to 5000 litres, and are highly insulated. Biomass boilers will produce excessive ash and wear if cycled like a conventional boiler, so an accumulator tank is required, unless your heat load is a lot higher than the boiler’s output. The basics of using an accumulator tank are to store hot water at around 80°c and use it in a controlled manor when it is required. They can be used in tandem with multiple heating technologies, such as biomass, solar thermal and/or traditional boilers. The heat generated by the boiler is stored from the top downwards to ensure long firing and smooth out the peaks and troughs of a typical heating load. Sensors at different levels in the tank measure the water temperature and either indicate to the operator that the tank needs re-charging manually, or for automated systems, fire up the boiler when required. Once the desired temperature has been achieved a signal is sent to the boiler to shutdown. Accumulator tanks are very useful for systems that fire once a day, such as log boilers. They help reduce the size of the boiler required as they enable the storage of energy in reserve to be used during peak demand, thus reducing the number of times the boiler needs firing. This is particularly useful in situations where the heat load is not required all the time (e.g. during summer months when the boiler is only being run for hot water needs).